This study aims to define the types of reasoning employed by students in proportional and non-proportional cases. Descriptive research has been used to describe or portray the properties of a situation or phenomenon accurately. A total of 146 midde school students, including 70 fifth grade students, 45 sixth grade students and 31 seventh grade students participated in the study. In the study, a two-tier proportional reasoning diagnostic test developed by Hilton, Hilton, Dole and Goos (2013) was translated into Turkish and used as the data collection tool. The findings were analyzed by means of descriptive statistics methods. The study concluded that most of the students developed misconceptions since they utilized additive or absolute reasoning strategies instead of multiplicative reasoning strategies. Moreover, the students mistakenly employed additive reasoning strategies by acting as if there was an absolute change entailing the use of proportional reasoning and failed in determining when to use proportional reasoning strategies. Proportional reasoning is essential for many different disciplines as well as for mathematics. For that reason, this study suggests that teachers identify the strategies inaccurately used by students and prepare a course plan according to their conceptual and operational deficiencies. Bu çalışmada, öğrencilerin orantısal ve orantısal olmayan durumlarda kullandıkları akıl yürütme türlerinin tanımlanması amaçlanmıştır. Bir durumun veya olgunun özelliklerini, durumunu doğru bir şekilde tasvir etmek ya da resmetmek için betimsel araştırma kullanılmıştır. Bu çalışmaya 70 beşinci sınıf, 45 altıncı sınıf ve 31 yedinci sınıf olmak üzere toplam 146 ortaokul öğrencisi katılmıştır. Çalışmada Hilton, Hilton, Dole ve Goos (2013) tarafından geliştirilen iki aşamalı orantısal akıl yürütme teşhis testi Türkçeye çevrilerek veri toplama aracı olarak kullanılmıştır. Bulgular betimsel istatistik yöntemleri kullanılarak analiz edilmiştir. Araştırma sonucunda öğrencilerin büyük bölümünün çarpımsal akıl yürütme gereken yerlerde toplamsal veya mutlak olarak düşündükleri için kavram yanılgılarına sahip oldukları görülmüştür. Ayrıca öğrencilerin orantısal akıl yürütmenin gerekli olduğu yerlerde mutlak bir değişim varmış gibi hareket ederek toplamsal akıl yürütme yapmaları, orantısal akıl yürütmenin ne zaman kullanılacağının belirlenememesi gibi hatalar yaptıkları görülmüştür. Orantısal akıl yürütme matematikte olduğu gibi farklı birçok disiplin için de önemlidir. Bu nedenle öğretmenlerin öğrencilerin hata yaptıkları stratejileri belirleyip, onlardaki kavramsal ve işlemsel eksiklikleri göz önünde bulundurarak ona göre bir ders planları hazırlamaları önerilmektedir. Baxter G. P.,Junker, B. A (2001) Case study in proportional reasoning. Paper presented at the annual meeting of the National Council for Measurement in Education Seattle, Washington. Bayazit, İ.,&Kırnap-Dönmez, S. M. (2017). Öğretmen Adaylarının Problem Kurma Becerilerinin Orantısal Akıl Yürütme Gerektiren Durumlar Bağlamında İncelenmesi. Turkish Journal of Computer and Mathematics EducationVol, 8(1), 130-160. Behr, M. J.,Harel, G., Post, T., &Lesh, R. (1992). Rational number, ratio, and proportion. Handbook of research on mathematics teaching and learning, 296-333. Boyer, T. W.,&Levine, S. C. (2012). Child proportional scaling: Is 1/3= 2/6= 3/9= 4/12?. Journal of Experimental Child Psychology, 111(3), 516-533. Bright, G. W.,Joyner, J. M., & Wallis, C. (2003). Assessing proportional thinking. MathematicsTeaching in theMiddle School, 9(3), 166 172. Cramer, K. & Post, T. (1993). Proportional reasoning. The Mathematics Teacher, 86(5): 404-407. Cramer, K., Post, T., &Currier, S. (1993). Learning and teaching ratio and proportion: Research implications. Research ideas for the classroom: Middle grades mathematics, 159-178. Çelik, A.,& Özdemir, E. Y. (2011). İlköğretim öğrencilerinin orantısal akıl yürütme becerileri ile problem kurma becerileri arasındaki ilişki. Pamukkale Üniversitesi Eğitim Fakültesi Dergisi, 30(30), 1-11. De Bock, D., Van Dooren, W., Janssens, D., &Verschaffel, L. (2007). The illusion of linearity: From analysis to improvement. New York: Springer. Denison, S.,&Xu, F. (2010). Twelve‐to 14‐month‐old infants can predict single‐event probability with large set sizes. Developmental Science, 13(5), 798-803. Dole, S., Wright, T., Clarke, D., & Hilton, G. (2007). Making connections science and mathematics: The MCSAM Project. In U. Cheah, Y. Wahyudi, R. Devadason, K. Ng, J. Chavez, & D. Mangao (Eds. ), Redefining learning culture for sustainability(pp. 184–194). Second International Conference on Science and Mathematics Education, Penang, Malaysia, 13–16 November 2007. Fernández C.,&Llinares, S. (2009). Understanding additive and multiplicative structures: the effect of number structure and nature of quantities on primary school students' performance. InFirst French-Cypriot Conference of Mathematics Education, 1-18. Fernández C.,Llinares S., Modestou, M., &Gagatsis, A. (2010). Proportional reasoning: how task variables influence the development of students' strategies from primary to secondary school. Acta Didactica Universitatis Comenianae Mathematics-ADUC, 10, 1-18. Hiebert, J. &Behr, M. (1988b). Introduction: Capturing the major themes. In J. Hiebert&M. Behr (Eds. ), Number concepts and operations in the middle grades(1–18). Hillsdale, NJ: Erlbaum and Reston, VA: National Council of Teachers of Mathematics. Hilton, A., Hilton, G., Dole, S., &Goos, M. (2013). Development andapplication of a two-tier diagnostic instrument to assess middle-years students’ proportional reasoning. Mathematics Education Research Journal, 25(4), 523-545. Hoffer, A., R. &Hoffer, S., A., K. (1992). Ratios and proportional thinking. In Thomas R., Post (Ed), Teaching Mathematics in Grades K-8: Research Based Methods(pp. 303-330). Massachusetts, Allynand Bacon. Johnson, B.,&Christensen, L. (2000). Educational research: Quantitative and qualitative approaches. Allyn&Bacon. Kaput, J. & West, M. M. (1994). Missing value proportional reasoning problems: Factors affectingi nformal reasoning patterns. In G. Harel&J.Confrey (Eds. ), The development of multiplicative reasoning in the learning of mathematics(235–287). Albany, NY: SUNY Press. Karplus, R.,Pulos, S.&Stage, E. (1983). Proportional reasoning of early adolescents. InR.Lesh&M. Landau (Eds. ), Acquisition of mathematics concepts and processes(45–90). Orlando, FL: AcademicPress. Küpçü, A. R. (2012). Etkinlik temelli öğretim yaklaşımının ortaokul öğrencilerinin orantısal problemleri çözme başarısına etkisi. Ahi Evran Üniversitesi Kırşehir Eğitim Fakültesi Dergisi, 13(3). Lamon, S. J. (1993). Ratio and proportion: Connecting content and children's thinking. Journal for research in mathematics education, 41-61. Langrall, C.,&Swafford, J. (2000). Three balloons for two dollars: Developing proportional reasoning. Mathematics Teaching in the Middle School, 6, 254-261. Lesh, R., Post, T., &Behr, M. (1988). Proportional reasoning. In J. Hiebert& M. Behr (Eds. ),Number concepts and operations in the middle grades(pp. 93-118). Reston, VA: Lawrence Erlbaum&National Council of Teachers of Mathematics. McCrink, K.,&Wynn, K. (2007). Ratio abstractionby 6-month-old infants. Psychological science, 18(8), 740-745. Milli Eğitim Bakanlığı (2013). Ortaokul matematik dersi 5-8. sınıflar öğretim programı. Ankara: MEB Talim Terbiye Başkanlığı Yayınları. Misailidou, C.,& Williams, J. (2003). Diagnostic assessment of children’s proportional reasoning. Journal of Mathematical Behaviour, 22, 335–368. Modestou, M.,Elia, I., Gagatsis, A., &Spanoudis, G. (2008). Behind the scenes of pseudo proportionality. International Journal of Mathematical Education in Scienceand Technology, 39(3), 313-324. Nabors, W. K. (2003). From fractions to proportional reasoning: a cognitive schemes of operation approach. The Journal of Mathematical Behavior, 22(2), 133-179.National Council of Teachers of Mathematics. (2000). Principles and standards for school matthematics. Reston, VA: Author. Noelting, G. (1980a). The development of proportional reasoning and the ratio concept. Part 1 – Differentiation of stages. Educational Studies in Mathematics, 11, 217–253. Philippou, G.,&Christou, C. (2002). A study of the mathematics teaching efficacy beliefs of primary teachers. Mathematics Education Library, 31, 211-232. Resnick, L. B. (1983). Mathematics and science learning: A new conception. Science, 220, 477–478. Sophian, C. (2000). Perceptions of proportionality in young children: Matching spatial ratios. Cognition, 75(2), 145-170. Spinillo, A. G.,&Bryant, P. (1991). Children's proportional judgments: The importance of “half”. Child Development, 62(3), 427-440. Singh, P. (2000). Understanding the concept of proportion and ratio among grade nine students in Malaysia. International Journal of Mathematical Education In Science and Technology, 31(4): 579-599. Tamir, P. (1989). Some issues related to the use of justifications to multiple-choice answers. Journal of Biological Education, 23, 285–292. Treagust, D. F. (1995). Diagnostic assessment of students’ science knowledge. In S. M. Glynn& R. Duit (Eds. ), Learning science in the schools: Research reforming practice(pp. 327–346). Mahwah, NJ: Lawrence Erlbaum. Treagust, D. F. (2006). Diagnostic assessment in science as a means to improving teaching, learning, and retention. Paper presented at the Uni Serve Science Symposium Proceedings Assessment in ScienceT eaching and Learning, Sydney, NSW, Australia. Uçar, Z. T.,& Bozkuş, F. (2016). İlkokul ve Ortaokul Öğrencilerinin Orantısal Durumları Orantısal Olmayan Durumlardan Ayırt Edebilme Becerileri. 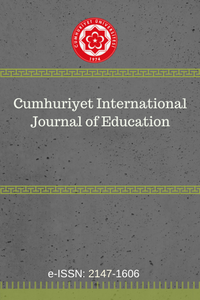 Journal of Kirsehir Education Faculty, 17(3). Van De Walle, J. A.,Karp, K. S., & Bay-Williams, J. M. (2012). İlkokul ve ortaokul matematiği: Gelişimsel yaklaşımla öğretim (Çev. S. Durmuş). Ankara: Nobel Yayıncılık. Van Dooren, W., De Bock, D., Janssens, D., &Verschaffel, L. (2008). The linear imperative: An inventory and conceptual analysis of students’ overuse of linearity. JournalforResearch in MathematicsEducation, 39(3), 311-342.